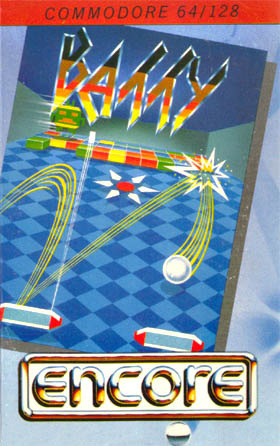 The basic premise is the same as that of Arkanoid and similar games: destroying square blocks by hitting them with a ball, which is controlled by deflecting it with a player-controlled bat. The process is made harder by "Aliens" in the shape of a UFO or a bird which hover over the screen, dropping bombs. Although the aliens can be dispatched by striking them with the ball or even, if they work their way down the screen, by running them over with the bat, they can deflect the ball and present an extra challenge for the player who has to dodge their bombs while trying to keep the ball going. Some blocks, when struck, contained special power-ups which would fall and could be collected by the player's bat to give certain abilities. Long bat - which enlarges the bat to make hitting the ball easier. Warp - which warps the player to the next level. Laser - which allows the player to shoot the blocks with a laser mounted on the bat. The game allowed three modes of play, one and two player "turn-taking" and a two-player simultaneous play by allowing each player's bat to only move in "their half" of the screen, which required co-operation between the two players to keep the ball going, especially if Aliens were present as then even the idle player (the one who does not have the ball on their side) had to avoid any dropped bombs and the aliens themselves. Different levels presented different obstacles through which the ball had to be navigated to destroy all the breakable blocks, and some incorporated a "gravity" device which altered the path of a ball if it strayed near while it was activated.